310 Rib Fittings | Tennessee Aircraft Services, Inc. Recently, I received a call from a mechanic asking if I’d be willing to do some structural work on a customer’s 310. I said yes first, then asked what the job was. (There’s something enticing about drilling structural parts off a plane). 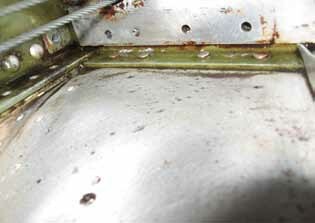 The problem was four steel fittings that had rusted which helped connect a wing rib to the rear wing spar behind the engine nacelle. These are not particularly large pieces and don’t make themselves obvious during routine inspection. Masked under a thick layer of water, debris, and general goo hid their true condition. It took an intentional effort to clean away the obstructions for a proper inspection. The result was pretty ugly and worth finding. Externally, the plane is beautiful. For the most part, the interior airframe looks clean and well kept. Certainly not a plane that one would expect to find severe rust or corrosion. An inexperienced, apathetic, unconscientious, or just plain lazy mechanic might have been tempted to glaze over the inspection and potentially miss an important problem. It’s a tired cliche but one can’t judge a book by its cover. Fortunately, this T310R was inspected by a mechanic with an interest in doing the job right. Before the disassembly, locating the needed parts is always a good idea. The obvious first stop is the illustrated parts manual. It is soon discovered that these little steel brackets are not listed separately, but they are part of a larger assembly. 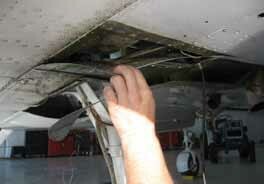 Cessna tech support is excellent to help as much as they can in these situations. A phone call to Cessna gives us a complete break down of all the parts that make up the rib assembly, including the needed steel fittings. Unfortunately, armed with the part number for the bracket we discover that Cessna no longer makes them or the rib assembly that contains them. We are given probable prices for the fittings but no delivery date as Cessna must determine if they still have the fixtures for the parts. In the meantime, we start looking for used serviceable brackets and rib assemblies. As is turns out, no one has the fittings alone so we purchase entire rib assemblies to get the parts we need. It seems like a waste to scavenge the fittings and toss the remainder of the assembly aside, but that’s the reality of legacy parts acquisition. A large area of the underside of the wing and nacelle must be drilled partially off to give workable access to the brackets. There’s always the concern that previously unseen corrosion will be discovered between the skins and ribs, but this time all is in fairly good condition. Even with so much disassembled, working from underneath and in the corners is still an exercise in patience. The brackets sandwich the web of the rib and are fastened in place with four Huck pins. A Huck pin is basically a steel bolt with an aluminum collar that is swedged into grooves where threads would be if it were a bolt. 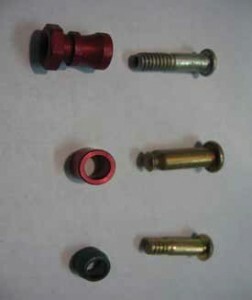 These are considered permanent fasteners so easy removal was not a particular consideration. All one must do is remove the collar and tap the pin out, how hard can it be? A sharp chisel driven into the collar with a hammer opens the collar on one side. Being aluminum, it is then spread open and slid off the pin. Unfortunately, it’s very difficult to swing a hammer or control a chisel in such a small space. A slip of the chisel sends it through the rib or the spar ending or some other hard to repair part and ends the work day on a very bad note. A better choice in this situation is a bayonette spot face cutter. A bayonette spot face cutter is a little like a drill bit with flat flutes and a hole in the center. A cutter is chosen that has a pilot hole of the same inside diameter as the outside diameter as the pin being removed. The outside diameter of the cutter should be close to that of the outside diameter of the collar. As the cutter spins, it is set over the tail of the pin and shaves off the collar. The cut is made until just a thin sliver of the collar remains. It will look a bit like a washer. By this point the remainder of the collar won’t be holding the pin any longer, so the pin can just be pushed out of the hole like a bolt after removing the nut. One advantage of the cutter is that it can be mounted on a flexible drill “snake” extension for access in difficult areas. It’s also much easier to control and less likely to ruin your day. 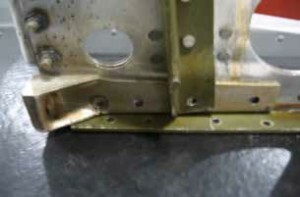 Once the Huck pins are removed, the one bolt that connects the brackets to the aft wing spar is removed and the part can be lifted out. Now the entire area can be thoroughly cleaned and prepped for application of a long term corrosion inhibitor. Paint type primers are inappropriate for this application because all the surface areas can’t be properly cleaned. There are also the mating surfaces where paint won’t get to at all. There are several corrosion inhibitors that I have used and believe do a good job wicking in between parts to displace moisture: ACF-50, Corrosion X, LPS-3, Dinitrol AV-8, BoeShield, and Cor-ban. Some are like spray on oils that need to be reapplied from time to time while others are applied and cure to a dry wax-like consistency and are much longer lasting. Which is best for any particular application is an article in itself, but the important part is to use something to protect these bare metals. the wrench. The two parts are connected with a thin section that is designed to break when the full torque is applied. After the hex head breaks away, only the smooth lower section remains on the Hilok to hold it in place. The skins and fairings removed for access must now be reinstalled. Standard solid aluminum rivets are used everywhere possible. There isn’t a way to get a bucking bar on most of the rivets so blind fasteners like the CherryMax rivet are used. 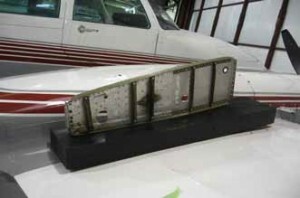 For those that lament the use of CherryMax rivets might consider that Cessna used blind rivets on the aft flange of the forward wing spar on the 310 series for pretty much the entire length of the wing. Just take a look under the next 310 wing you see and you’ll notice blind rivet heads from the wing tip all the way to the engine nacelle. Those have been there doing their job for several decades. For some added adhesion and parts stability, one might also add a structural adhesive between the skins. This is a process recommended by Cessna many years ago in Cessna Service Letter ME77-6. Last step is to paint all the rivet heads with primer then base coat to protect them from corrosion and the Cherrymax center stems (steel) from rust. The need to paint something on the outside of the plane is one reason to use a corrosion treatment other than ones that remain liquid, like Corrosion X or ACF-50. Either of these will work their way through any seam and contaminate the paint prep surface. The work is done and the plane is ready to fly. Another catastrophe averted. Of course, had the owner started a corrosion inspection or treatment plan several years ago, the entire event could have been averted. Owning a plane as old as our legacy Cessnas that never had any extra corrosion inhibiting treatment, one must expect to take some active measures to prevent aging problems. You may have assumed this article is about replacing some fittings deep inside the wings of a Cessna T310R. 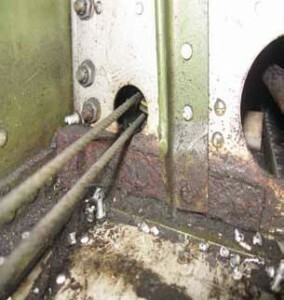 Actually, it’s about the inspection that found the problem and the realities of owning a machine this old (or older). The FAA requires an annual or 100 hour inspection for a reason: they know something should be found. A good mechanic making a thorough inspection can help ensure you and yours are flying in a mechanically sound airplane, not to mention saving some future expenses in the process.